The American Red Cross President and CEO Marsha J. Evans' salary for the 2011 was $951,957 plusexpenses. UNICEF CEO Caryl M. Stern receives $1,900,000per year (158K) per month, plus all expenses including a ROLLS ROYCE. The Salvation Army's Commissioner Todd Bassett receives a salary of only$13,000 per year (plus housing) for managing this $2 billion dollar organization.96 percent of donated dollars go to the cause. The American Legion National Commander receives a $0..00 zero salary. Your donations go to help Veterans and their families and youth! · The Veterans of Foreign Wars National Commander receives a $0..00 zero salary. · The Disabled American Veterans National Commander receives a$0..00 zero salary. · The Military Order of Purple HeartsNational Commander receives a$0..00 zero salary. · The Vietnam Veterans Association National Commander receives a$0..00 zero salary. My dear, what changes you are observing in this time of revelations. All will be exposed and removed so that only light remains. One thing I feel that I must point out is that those who refuse to accept the reality of the situation your world is in and close their eyes to everything around them, actually become accomplices of the dark. You must learn to embrace change, for nothing can go forward until you do. The Cabal is using every trick in its arsenal to fool you into accepting GM crops, vaccinations, the fluoride in your water supply, etc. NO is just a simple, two-letter word, but it is effective in refusing to be treated like sheep. When you come together and say an emphatic NO, they will not have a leg to stand on. Their game is up. You now see through it and your eyes are open. It is time to take back everything that is yours. It is good to see that so many are taking back their sovereignty. Soon, you will be able to get a Universal Birth Certificate. That will free you from all religious control. Then you will no longer be slaves. You will become free spirits having an experience on Planet Earth. Many of you are aware that you have a purpose. It is time to fulfill your purpose. You will be guided. It is all in your hands. Together, you have the power to change your world completely from dark to light. Many of you who were great in times past and achieved much, chose to return to Earth to be part of the Transition. You are all finding each other and working together. You are even recognising each other from past lives, in some cases, just as you and I did, my dear. The right people are now in place in many parts of your world. They are exposing the dark ones and all their sinister plans. As a result of this, children will live their lives in the future without fear of abuse from any quarter. This abuse has come from the top down. This is why it was not exposed, for the control the Police and the Press, and until now, they were not answerable to anyone. So for years the abused had no voice. All this is changing now. Brave people have come forward to reveal their truths. This exposure will shock many of you but the truth must be told. It is all part of the healing process. Some of you have come a long way and are eagerly wanting change now. Help others to get up to speed, for they are holding you back. The deliberate destruction of the ley lines in every country has kept you slaves in darkness. It is important to understand the great importance of the Energy Grid. It must be reinstated as soon as possible. It will make a tremendous difference to the energy of your world. They do not have any right to cover and destroy this grid. This is an extremely important part of the Transition. There are those who are equipped to carry out this work. It must be done. So help will be provided. You just need to ask. My goodness, what an exciting time to be on Earth. We can only watch and assist. My dear wife is doing much to expose and remove the Dark and the Corrupt. Her computer was hacked into on two occasions, which has caused her many problems. There are too many people working for the Light now for the Dark Ones to deal with all of them. This light is spreading far and wide, especially in that dear land of Ireland, where the Transition must begin. You have everything to gain and nothing to lose. It is just a question of facing the truth and being FEARLESS. Believe in yourselves. Take back your power. The so-called power structure that has kept you in slavery has no power over you without your acceptance of it. When you do your own research, it will all become as clear as a bell. You will wonder how you could have believed such blatant lies for so long. I remind you, once more, that “nothing is as it seems”. The one hierarchy rules the whole world. It also believes it owns the world and everyone in it. Well, it will be interesting to see what happens when the penny drops and it is all exposed. Watch this space ! It will not be long. It is gathering pace. The corrupt have reached the heights, so they have a long way to fall; and fall they will, as it is time for new beginnings. Open your hearts and minds to the truth. It will set you free. My dear, you are tired. Do try to relax more. I know it is exciting to watch the dam burst and the truth flowing from all quarters. Our gratitude to all who share truth with others. This is a very important role to play. It is all coming together very nicely. My love surrounds you, my dear, and those who help you fulfil your role in these new beginnings. An orchestra and popular choir singing the 9th. Symphony in the street. "The first part of the Masterplan pertains to the breakthrough of Light on the non-physical planes. The Light forces use advanced vortex technology for clearing the non-physical planes. All those vortexes create a network of Light that gets stronger and stronger day by day. At a certain point a critical mass of Light will be reached and it will result in a massive arrival of the Light forces on the mental, astral and etheric non-physical planes inside the thin layer that surrounds the surface of planet Earth and now still contains a few Archons and their many reptilian minions with their negative technologies. That breakthrough will remove all remaining darkness from non-physical planes. Resistance's surface operatives will then contact key people of that fluid surface group. Some of those key people are in positions inside Russian, Chinese and US military. Those key people will be contacted in person or over the phone and will be offered a simple choice. They will be invited to be part of the Event operations. They will either accept or decline according to their free will decision. They will be given a few minutes to make that choice. If they accept, they will receive further instructions who to contact and what to do. If they decline, they will not be contacted anymore. Those people that will be then contacted directly from the key group will make their own decisions and so the fluid group will spring into action. This whole process will be very fast and it will be a surprise for the Cabal. There will most likely be no advance »Green Light« notifications over the internet because the surprise element would then be lost." (NaturalNews) Roughly 85,000 fewer people living in North America will be forced to drink and bathe in fluoridated water, thanks to four recent community victories preventing or overturning water fluoridation mandates. YEAH! The towns of O'Fallon, Missouri; Rosetown, Saskatchewan; Lake View, Iowa; and Cassadaga, New York are all now officially fluoride-free, proving that individuals really do have the power to step up and protect themselves against one of the most ridiculous folklores of the past century to be thrust on the people in the name of public health. As reported by the Fluoride Action Network (FAN), which has tabulated more than 70 community victories against fluoride across North America since 2010, a single citizen activist concerned about the safety of fluoride was able to persuade the City Administrator of O'Fallon, MO, population 80,000, to discontinue the town's water fluoridation program. The town's 2012 budget report states that the change will save the town $18,000 annually, and reduce the hazard for water operators who will no longer "have to handle the dangerous chemical on a regular basis." In Rosetown, SK, the failure of a fluoride feed pump was enough to scrap the outdated practice of water fluoridation, while water fluoridation's high cost with lack of economic and societal benefit convinced the city council of Lake View, IA, to discontinue the pointless practice. And in Cassadaga, NY, local citizens rejected a proposal to fluoridate by an 87 percent margin, even after the town had already built a special shed to begin housing and pumping fluoride chemicals into the water supply. In Portland, Oregon, where rogue city council members and Mayor Sam Adams recently forced through a fluoridation mandate against the will of the people, more than 43,000 local citizens signed a petition to force the issue to a public vote. As of this writing, these signatures are still being counted -- but since only 19,858 were required to get the issue on the ballot, the issue will almost surely be put up for a public vote. And in New York City, where councilman Petter Vallone, Jr. has been working feverishly to end water fluoridation in America's largest city, a resolution has been introduced to require that a warning about fluoride's dangers for infants be printed on individual water bills. Both Milwaukee, Wisconsin, and the entire state of New Hampshire recently passed similar requirements for infant warning labels on water bills. IMPORTANT NOTICE: FYI This pertains to any funds offer including the St Germain Trust. This is the second time this week I have seen this notice. if any from the re-valuation of the dinar. When the process begins, those receiving funds will receive it directly from St Germain's White Knights who will bring the funds directly to each recipient, along with instructions tailor-made for that recipient. St Germain knows who each of us are and where we are; he does not need our names, addresses or any other kind of information. The distribution of these funds will only occur AFTER the exposure and arrest of any and all "dark hats" who are currently broke and getting broker - which is why they are after any and all sources of money they can find. This includes pretending to represent St Germain and getting people's information so they can rip you off if you get anything and possibly take you out! Part of what was going on in Libya when Gadhafi was still present was not about the oil, but about laying hands on the 800 metric tons of gold in Libya's Central Bank. The "dark hats" stole that gold during all the confusion - and St Germain beamed it away from them to use for the people of the planet. Hurricane Sandy was a geo-engineered storm - as was the follow-on one - to get gold from the Federal Reserve building and have us believe the gold "evaporated" in the salt water or some such thing! In other words, having any kind of or large amount of money is not safe for ordinary people who have no means of protecting themselves from this level of chicanery / kind of robbery. While the people involved at the local level are well-intentioned and wanting to help - being aware as they are of the financial difficulties of those around them - it is the ones behind them we should be concerned about. It is to ensure people's safety that money is not being distributed until the arrests are complete, and the planet is free of these dark influences. Waiting just a little longer will give us all a completely safe environment and the sureness of being in the good and caring hands of St Germain and his appointed White Knights. 7 HOLD ON HERE WE GO! The success of these events will create the necessary catalyst that will result in the birthing of the New Earth in all her resplendent glory. This birth will take place in the Realms of CAUSE during Earths alignment with the galactic core of the Milky Way, which will happen during the days of the Solstice, December 21-22, 2012. Even though we will not experience all of the perfection of the New Earth in our daily lives on December 23, 2012, the Company of Heaven want us to understand that once something has occurred in the Realms of CAUSE nothing can prevent it from eventually manifesting in the world of EFFECTS. The only variable is how long that will take and that is up to you and me and every other person existing on Earth. The patterns of perfection for the New Earth must be drawn into the physical plane, the world of Effects, through the thoughts, words, feelings, actions, and beliefs of the Sons and Daughters of God abiding on Earth. These patterns include the archetypes for both our New Planetary Cause of Divine Love and our newly birthed Renaissance of Divine Love. The paradigm for the New Earth reflects the profound Truth that We are One with ALL Life and that there is no separation. It also contains the viable solutions that will allow Humanity to respond to every situation on Earth with Reverence for ALL Life. The first step of this 40-day process begins today with the influx of Light that occurs every year on November 11th, 11:11. This year we are experiencing an exponential expansion of the Light that was anchored last year, in the core of purity, in every electron of precious Life energy on Earth. That occurred during the 11:11:11 celebrations of November 11, 2011. That influx of Light activated Humanitys pineal glands and began the initial impulse of Earths Ascension into her new 5th-Dimensional Solar Reality. That event greatly expanded our new Planetary CAUSE of Divine Love. The success of that facet of the Divine Plan paved the way for the Birth of a Renaissance of Divine Love which occurred during the 25th Anniversary of Harmonic Convergence in August 2012. Eleven is the master number that reflects THE TRANSFORMATION OF THE PHYSICAL INTO THE DIVINE. Every man, woman, and child embodied on Earth has the sacred geometry of 11 and 11:11 and 11:11:11 encoded within the Divine Potential of our RNA and DNA structures. These codes are activated by our I AM Presence when we move through various phases of our Ascension process. During the next six weeks, our I AM Presence will activate these codes in new and profound ways. This will accelerate the Divine Alchemy of Humanitys transformation from carbon-based planetary Beings into crystalline-based Solar Light Beings. This activation will be greatly intensified by the Solar and Lunar Eclipses that will take place this month. On November 13, 2012, we will experience a very powerful New Moon Solar Eclipse. The Light flowing into the Earth through this celestial alignment will enhance Earths Ascension into her new Solar Reality. The Solar Record Keeper Crystals that were placed throughout Earths Crystal Grid System during the influx of Light on 11:11:11, and the new frequencies of the 5th-Dimensional Solar Violet Flame of Gods Infinite Perfection that Saint Germain and his Legions of the Violet Flame secured on Earth in May 2012, will be amplified a thousandfold during this Solar Eclipse. This will allow the necessary purging of the Earth and the cleansing process that is being accomplished by the Elemental Kingdom to move forward in more gentle ways. On December 12, 2012, 12:12:12, our Mother Godthe Holy Spirit, and the Feminine Aspects of Deity throughout all Creation, will breathe into the Earths Crystal Grid System the highest frequencies of Gods Transfiguring Divine Love that Life on this planet is capable of withstanding. Due to the monumental influxes of Light that have occurred over the past several decades, and especially since the Dawn of the New Millennium, this will be the greatest influx of Divine Love Humanity has ever experienced. For over 500 years, December 12th has been celebrated in Mexico and throughout Central and South America as the Feast Day of the Virgin of Guadalupe. For millions of people this aspect of Mother Mary has symbolized the return of the Divine Feminine, our Mother God. On 12-12-12, our Mother God, and Her exponents representing the Divine Feminine throughout all Creation, will cocreate a Forcefield of Divine Love that will envelop every atomic and subatomic particle and wave of Life on Earth, and all of the spaces in-between the particles and waves of Life. This forcefield will reinforce a multidimensional and multifaceted Womb of Divine Love and a Birth Canal of Divine Love that will assure Earths safe passage up the Spiral of Evolution, and the Birth of the New Earth in the Realms of Cause. The Beings of Light are aware that in most instances this information is beyond the comprehension of our finite minds. But they assure us that the I AM Presence of each and every one of us clearly understands the bigger picture of what is happening on this planet. They said that adding to the Light of the world during this miracle of the Shift of the Ages and the Birth of the New Earth in all her splendor, is exactly why we volunteered to embody on Earth at this time. the transformation of the physical into the Divine. Isnt God fun? On December 21-22, 2012, the Earth will align with the Galactic Core of the Milky Way. This will open a portal of Light that will extend from the very Heart of our omniscient, omnipresent, omnipotent Father-Mother Godthe Cosmic I AMAll That Is, into the Divine Momentum pulsating in the center of the Earth. This influx of Light will flow through Gods all-encompassing Divine Matrix to bless every particle of Life on this planet. This Divine Matrix is the Body of our Father-Mother God within which all Creation lives, moves, breathes, and has its Being. This influx of Light will begin the process that will Birth the New Earth in the Realms of Cause. This will be Earths New Beginning. From that moment forth, the patterns of our Planetary Cause of Divine Love and our Renaissance of Divine Love will easily flow into the mental and emotional strata of Earth. Humanity will be able to easily tap into these patterns of perfection and through our thoughts, words, feelings, actions and beliefs we will bring them into manifest form. These patterns contain the viable solutions to every humanly-created malady existing on Earth. The Company of Heaven has given us an activity of Light that will greatly assist in preparing Humanity and the Earth for the influxes of Light that will take place during the next six weeks. Please participate in this opportunity according to your Hearts Call. This is our moment. Our time is at hand. Now our Father-Mother God invoke the Angels of Transfiguring Divine Love from the very Core of Creation and direct them to traverse the planet north, south, east, and west. In response to our God Parents Heart Call, these selfless messengers of God enter the aura of every man, woman, and child on Earth in preparation for an Activity of Light that will bathe the planet in 5th-Dimensional Crystalline frequencies of Transfiguring Divine Love. This frequency of Love is beyond anything Humanity has ever been able to receive. On this sacred and holy day, we have set in place the basic spiritual forces of Divine Love over which Humanity will now Ascend out of our long exile in darkness into the 5th-Dimensional Realms of Light. Every person on Earth is now being raised into a profound awakening of supreme Love consciousnesswe are, here and now, the Masters of Love we were always destined to be. We are Beings of Love, fully accepting responsibility for Loving this sweet Earth and all her Life FREE. We are One with this blessed planet, and the planet is One with us. I AM a forcefield of Transfiguring Divine Love. The Love of God is now thriving on Earth through me, and through the I AM Presence of every person on the planet. The blazing Sun of Transfiguring Divine Love that is now enveloping the Earth is transforming into Light every frequency of energy, vibration, and consciousness that is less than Gods Divine Love. a good illustration of the shocking vastness of the destruction that was wrought by Hurricane Sandy in New Jersey and New York. As anyone can clearly see, it will take lots of work and lots of time for many communities to be restored. wait for the government to help them in the freezing cold. They need OUR help now. of local volunteers who are on the ground now, to help us help them coordinate their relief efforts, in the hardest-hit communities of New Jersey, New York City and Long Island. IMPORTANT NOTICE: FYI This pertains to any funds offer including on the St Germain Trust. This is the second time this week I have seen this notice. St Germain is the only one who is authorized to distribute any funds to the people of the planet, including whatever or if any from the re-valuation of the dinar. addresses or any other kind of information. We will begin this message regarding 2013, a truly auspicious year, by addressing the fears some of you may yet have. We will first tell you the Ascension of the Planet will indeed occur. You have made it so. But we want to clarify it is the graduation of the Planet Earth, an expansion into 12 Dimensions that has taken place. Many of your Mayan researchers have sought to understand what the long calendar date of Dec 21, 2012 implied. They have questioned if it might have been written not by Maya, but by their 'Star-Nation Gods'. Some were concerned it implied a cataclysmic end to the planet. Others felt it may be marking the date of the 'Return of the Star-Gods', as implied in some of the preserved Mayan texts. We will tell you that the Ascension is a new beginning. And in 2013, the Earth is in the new format that will allow for the prophesized 'Return'. But the much talked about 'Contact' will not occur in the 3d way you may think. Rather will it be humanities ability to rise lucidly, ascend consciously into higher dimensions. That is how contact will occur. It is no longer a planet in which the benevolent teachers must physically manifest into 3d in order to assist. The New Earth now carriers a matrix through the Crystalline Grid that will enable humanity to be more aware of their true nature within multidimensionality. It will happen. And in so doing you will become aware of the fact that YOU are the ones you have been waiting for !!! It will take a few more years. But it begins in 2013. As we have told you before, the Ascension of Humanity en masse occurs in some 300 years! And indeed this will also happen, but it is absolutely the Ascension of the Earth that enables the Ascension of Humanity. All in time, all will happen in due time. Do you understand? Now accordingly, the vast majority of humanity will not see any immediate change on the Earth. They woke on December 22, 2012, and said "What was the big deal?" Even those of you on the path, see that no immediate visible change has occurred. We gently ask all of you to look at the world around you for just a moment. What do you see ? Your media outlooks are still reporting war, famine, disasters and predicting economic collapse. And what is broadcast is what is seen in 3d. It is oft full of gloom and doom, is it not? The doomsday prophets are especially in high gear on this topic? Many of the 3d-doom speculators are on particularly fertile ground in this arena, generating fear followings around collisions of comets, asteroids, earthquakes, cataclysmic polar reversals and economic collapse. Whether these naysayers recognize it or not, they feed on the fear they generate. Masters, there have always been , and will continue to be the naysayers on the planet, those who predict gloom and doom and warnings of fear. What is not recognized, is that even these who seem to be rooted in negativity, serve a purpose in duality, and certainly a quick glance around the globe would seem to justify their stance. But we tell you it is old energy. And it is not the role of Spirit to ever tell you to give up hope, or to let go of your free will. Our message is to tell you of your Divinity, and to tell you as a matter of fact, as a point of truth, that the planet is now on the cusp of 'Year ONE of the New Earth'. Indeed humanity will follow and in rapid time, will also Ascend. You are absolutely on track for that to happen. So Dear Ones, we tell you again the Ascension of the Planet did occur, and humanity has made it so. Even if much of humanity does not recognize it in 3d consciousness, the Earth has indeed changed, graduated into a new paradigm. So it is time to let go of old energy, of FEAR. The doom prophecy, the Global Cataclysmic disasters will NOT take place. The economy will not fall into chaos. What would that serve? It is not the path in the New Planet. We assure you that in 2013 a new sun dawning, and it is indeed the sun of change. It brings the light of the magnificent New Earth. And Dear Ones, we do mean magnificent. In this new era, it is incumbent upon the seekers to project joy, to project light, for in the expansion to Crystalline Harmonics, every photon of mental light you project is amplified. And this occurs more rapidly in the New Energy. So your roles take on a new benevolence, as your creation powers increase. So we speak in specifics of 2013 ! 2013 is an incredibly important year, in many ways more so than 2012. Many of you may have felt 2012 to be the apex, and that what follows is anti-climatic. Dear Ones, your work is only now beginning ! And we tell you that 2013 brings challenges and task that all of you agreed by soul contract to fulfill. 2013 is a new beginning, in every sense of the word. But it is not a time to rest on your laurels. The New Earth contains within its sequential linear flow, points of multidimensional intersection and time-gates. It is in fact the enhanced points of manifold time that allowed the Ascension to occur. These points are the gateways many of you that are envoys from the future, Sirian-Pleiadean-Arcturian Navigators and Code-Carriers entered through these portals to be here on the planet for the Ascension. And in many ways, your missions are just beginning. 2013 is a period then scheduled for the code-carriers to begin stitching these points together, in a hemispheric to global modality. Of particular importance is for the Code Carriers to blend the energies of that termed the northern hemisphere and Southern Hemisphere. Certain key apexes in the south such as Patagonia, Uluru, Easter island, and Kilimanjaro will be anchored to the New Firmament over the coming years. Those of you who have served as Code Carriers of the pre-Ascension, will be called to take on a greater role of connecting key points to the spawning of the New Firmament. The completion of the Crystalline Grid on the 12-12-12 will spawn the formation of the New Firmament. The New Firmament is vitally important to the Ascension of humanity and is indeed an extension of the completed grid. Certain points on your planet have the rare energetics that enable them to be connecting points. Newgrange is one of these, Easter island is another . Both are multi-faceted, multi-dimensional grid points. Both are octahedronal Portals that transcend dimensions and time. Both are being connected directly to the apexial points of the stellated double penta dodecahedron of the 144-Crystalline Grid. These are being fashioned to connect directly to the New Firmament which begins spontaneous early formation after the completion of the 12-12-12 and rebirthing (rebooting) of December 21, 2012. It is important to note that the ascending processes of the Ascension occurs on the 12-12-12. The 12-12-12 allows for the Crystalline energy to manifest into the New Earth. It allows for the new DNA oif the planet to network within the Crystalline Field, connect to the New Grid and meld with the 'Human Grid'. This all occurs at 12:12 on the 12-12-12. A rebooting then takes place, and allows for the 'birth of the New Earth' to take place on December 21, 2012. Then begins the new work. We have spoken to you previously about the spawning of the new Planetary Firmament. This will externalize as two elliptical bands of iridescent frequencial arches that will encircle the earth as it did eons ago. One of these is a highly refined Electro-Magnetic in resonant synergy and emits a golden hue. The other is Crystalline, and emits a bright platinum coloration. These will revolve above the 144 double-penta dodecahedron of the 144 Grid. In highly technical terms, , the firmament will perform the function of transducing supra-crystalline frequency oscillations in a piezoelectric step-down to interface the grid, thus enabling full circuitry integration of the gamma-crystalline energies of the Unified Field from Tula, the Great Central Sun. In more understandable terms, the firmament will transform powerful celestial energy waves into a benevolent form that can be more easily received on the EarthPlane. So in a manner of speaking, the firmament is an enormous transformer and surge protector ! It will energetically 'polish' and further format & refine celestial energies into application in the 12 dimension of the earth. The two elliptical bands will create a frequencial field of OM. They will glow in the night skies in 2038 appearing somewhat similar to the Aurora Borealis. Now, the initial phase of anchoring the new Firmament will begin on the March Equinox of 2013. There will be an opening occurring at several key vectors including Easter Island and Patagonia ( at the key 51st latitude). Both will receive coded downloads of consciousness units termed Akash. These activating light-energy downloads will be received primarily through the major Phi Pyramidal octahedron energies and structures in the southern hemisphere in 2013. Many will be drawn to anchor them. As we have previously explained to you. There are a vast number of souls who have chosen to come to the Earth at this time, from dimensions beyond the fifth from both the future of Earth, and from the future of higher dimensional worlds with purposes that will become better understood to you in 2013. You are indeed Envoys of Crystalline Light, Ambassadors of Love. You have moved back from the future, in your terms, in linear Earth time, to assist mankind in navigating through the tumultuous times that have unfolded in the last forty years, and the times that will be presented in the next twenty six years leading to the key point of 2038. You see many of you are only truly awakened from your future into past roles in 2011 and 2012. And that was by design. The time gates of those two years were trigger points for the work you take on from 2013 to 2038. You see the New Firmament complete in your year of 2038. Is it not written in the Pyramids? Indeed your Edgar Cayce alluded to this year of 2038. It is another major benchmark in the Ascension of mankind. Some of you will not be physically present for 2038, but you will have key missions in assisting those being called for this duty. You will provide the pre assemblage in connecting anchor points and you will inspire the seekers of Crystal Children for the 2038 completion of the New Firmament. You see, many of you have experienced the Ascension of other planets and other worlds, several times; and you know the perils. You understand the mechanics. And what remains is the establishment of the new direction, the anchoring of the New Firmament. But never forget, in addition to anchoring Codes, it is essential in 2013 to assist all by shining your light, and not succumbing to the last throes of Fear , the last grasping kicks of the Old Energy. What happens in 2013 is a new beginning. That new beginning is the New Template of the New Earth. The Ascension of the Earth has allowed for the dimensional revision and expansion of the planet. The Earth is expanded to a Crystalline Field, expanded from the 5th to the 12th dimensions. There are certain key frequencies occurring on specific dates in 2013. The equinoxes, solstices, and eclipses are extremely powerful, each presenting unique portal opens of the New Earth. During the equinoxes, solstices, and especially the 5 eclipses of 2013, a resurgence of energies will flood the planet. It is absolutely a natural synergy that this would and will occur at these astronomical positions. For these three events (solstices, equinoxes and eclipses) truly open gateways, apertures that have always been unique events for such transfers. 2) Enhanced energies within power nodes, enhanced visioning and lucid dreaming. Now eclipses take on an even more unique quality, in terms of offering catalystic energy triggers of change both individually and for the planet. In 2013 these will be especially potent. It will be the perfect time to change course in your life, after mediating on the equinoxes and solstices toward self direction and calibration. 2013 is a new Planet, a new time, and many of you will discover a renewed purpose and take somewhat different paths, or remain on the same path with a new perspective or new group association. Many of you will discover a new purpose in 2013 or bring to the surface a prolific talent that was previously dormant. There will two specific phases of great importance in 2013. The first is between May 10-June 22nd, in which a great Triad opening occurs, allowing for rebalance and contemplation of new direction. This period involves a solar and lunar eclipse, leading to the June Solstice. It is also a time enhanced for travel to powernodes for Code Carriers. The second triad phase occurs between September 20 and November 4th. It is the action completion of what has taken place in the first triad. It represents a time for individuals to manifest the new self, the new purpose, the new partnership, association or direction. It is a time of intense re-energizing, re-vitalizing lifer force. We tell you that 2013 is a time to flow, a time to flower. It will be for many of you a year of change. There is a new energy on the planet. You have created it. There is much yet to do. Use this time to find your roles. Those of you who have been sitting on the fence, considering taking more committed roles of leadership, writing your book, expressing your inner artistry...2013 is your year. The energy will support your highest good. In 2013 you take your second wind. You take on new missions. For Code Carriers it is the new role of coding and anchoring the New Firmament, and it begins in 2013. You may copy and distribute this message only with permissions from EK Admin at Tyberonn@hotmail.com . With expressed authorization this message may be published online as long as you you do not charge for it, do not alter it any way, credit the author and include this entire copyright notice. These words express the importance of what you choose to believe. You can no longer turn a blind eye to what is obviously happening all around you. The Cabal has plans that would shock you to the core. They have followed a carefully planned path to bring about the destruction of your world as you know it. They no longer want or need you. This is why they flood your air with aluminum particles and put fluoride in your water, causing illnesses and much suffering. Why do you stand idly by and allow you and yours to be disposed of in such a manner? It is time you took action to protect humanity. You were told, my dear, that fifty years ago, humanity was ready for the transition. To prevent this, the Cabal brought in GM food, chemtrails, etc., which prevented this natural process. Now you are struggling to complete this most necessary process. Are you going to allow this opportunity to step out of third density to fail as well? Rediscover your own innate strength. You can do it. You just need to ask. Humanity has survived so much in times past. When you learn your true history, you will see this for yourselves. Those who are responsible for changing your world's history will soon answer for their crimes against humanity. Their edifice of control will crumble into dust as they fade from the history of your world. In the future, it will be known only as a bad episode in mankind's evolution. The sun will shine brightly again, giving out its healing rays, and its warmth will embrace and comfort humanity as it was meant to do. You have been told the timescale for the completion of the Transition and what must be done before it happens. The right people have come forward to help you. More help is needed. We will endeavor to bring it to you and the finance to see it through. It is a great burden for you, but you now have someone you can trust totally to work alongside you. We chose well, my dear. He is one in a billion. You are right: he returned to Earth specifically for this mission. You have worked together in the past. You understand what must be done. You have come a long way already. Dear Ones, matters have rally taken off with the coming of 11.11. which has opened a portal through which much Light has passed through you and into the Earth. Those of you who set the time aside to work with the Light have not only raised your own vibrations, but those of the planet. It is likely that as a result you felt uplifted and light headed, but it will settle down. Perhaps the most noticeable change within you, will be your recognition of a deeper sense of calmness and peace. As you partake in further upliftments, so you will become even more at One, and others will "feel" the powerful energies that you are sending out. You are now in the time you have been waiting for, and as you look around you will see changes taking place everywhere. It will bring joy and happiness into being, and that again will lift the vibrations. On a personal level nothing is more important than your preparations for Ascension. Whatever form you expect it to take, you will ascend and then all else will follow in quick order. Do not concern yourselves with material things, as all you need will be available to you, and indeed more. The plan for your well being has considered all aspects of your needs, and there will be a smooth transition from your present dimension to the 5th. dimension. Set out to enjoy the experience as it is unique and you are privileged to be one chosen for it. There is absolutely nothing to fear, and every soul will be loved and cared for at every stage. We will be accompanying you and ensure the process passes smoothly, and welcoming you into the higher realms. Because your minds are otherwise occupied, there is one aspect of your future lives that does not seem to have received much consideration. We refer to your marriages or partnerships as they will relate to the higher dimensions. You will no longer be bound by 3D vows and it will be up to each individual as to whether you wish to continue on the same basis, and you will find that you have much more freedom. Also unlike Earth where attraction is largely of a physical nature, the love of other souls is an exchange of energy that will be quite normal, as those you will be in the presence of will all have a vibration that will be in harmony with yours. However, you can "join" energies at an even higher level and for whatever purpose become as One. It may for example be to serve the Light together, and even introduce another soul in to your world. Such a union is far beyond anything you will have already experienced. As we have told you before, almost every aspect of your life as you understand it now will change. You will quickly adapt to a new expanded way of life, that will offer you so many opportunities to travel, whereas previously you have been confined to Earth. Not only that, but also into the higher dimensions where some souls are ready to take their place. Your Earth has been referred to as a "prison planet" and it is an accurate description, as because of your low vibration you have been prevented from leaving it. It is also why the Earth's energies have been contained, to prevent them polluting space beyond it. For the similar reasons you have also been kept in quarantine, so as to ensure that the experiment of experiencing duality was able to go ahead without outside interference. The only exception has been where certain Extraterrestrials have been given permission to contact you, because they have a similar low vibration to yours. Naturally as your vibrations have risen up which they have done so quite substantially over the last 30 years, you have attracted the attention of those who are more evolved. So you will in fact meet other civilizations of which you have little or no knowledge at present. We of the Galactic Federation of Light are of course already known to you, and are friends and family of long standing. The Earth will always hold fond memories for you in spite of the trauma and misery of many lives that have been sever challenges for you. This can be offset by the rapid spiritual growth that has resulted from such experiences. Nowhere else in the Universe can offer similar opportunities for growth, and it one of the main reasons that you took on such challenges. Eventually your memories of this period will fade into the background, but you will always benefit from the growth in your levels of consciousness. You will leave duality a far greater Being than when you first entered it, eons of time ago. So enjoy the coming weeks that are about to spring into action and bring you many of the changes you have been expecting. The old paradigm is collapsing beyond the point where it can be re-established, and we are ready to help you bring the new one into being. Indeed, behind the scenes much has been going on to this end and has advanced quite quickly. We continue to make more appearances in your skies than ever before, and when we can finally commence our flyovers we know they will be well received. We feel that at last you are beginning to relax and accept things as they happen, knowing that all is in order and you will benefit from our assistance which will speed matters up. Whatever is required to take place this side of Ascension will come about as intended. We wish that your media was released from the grip of those who adulterate your news, often deliberately distorting the facts to mislead you. Also so many laws have been introduced will be changed so that you have more freedom of information, and that no longer will secrecy be allowed as an excuse to hide the truth. The extent to which you have been kept in the dark is way beyond what you suspect, and you will be astonished at what has been developed for your Space programs. With the help of Extraterrestrials amazing advancements have been made in Space travel, as you will learn. Presently quite a few craft you see in your skies are your own, that you have been prevented from knowing about. I am SaLuSa from Sirius, and looking forward to the occasion when we can meet you and exchange friendly greetings. You will easily take to us as we are you from a higher level of consciousness. We have so much to share with you, and it will be a wonderful time. Our love freely flows to you at all times. http://treeofthegoldenlight.com and click on “Subscribe to our Lists” in the left hand column. When changing your address please remember to unsubscribe your old address. 14 BARACK OBAMA'S ROLE IN THE U.S.
BARACK OBAMA'S ROLE IN THE U.S.
Each week, we feature a newly channeled topic based upon the questions YOU submit. We ask the Keepers your questions, and post selected excerpts from the answers here. Barack Obama's karmic contract is to be a leader for the world, not just a leader for the U.S. His legal contract is to lead the U.S, but his karmic contract is to be a leader for the world. His karmic contract is to be a catalyst for enlightening change in the world. A catalyst is a substance or an object that facilitates change. It does not make the change occur – instead, it initiates and enhances a process and that is precisely what his role is to be. In fact, his contract to be a catalyst for a certain process has already been accomplished. His initial contract was fulfilled during and just after his election campaign. The changes he was meant to facilitate occurred in the hearts and minds of people across the world. In a sense, Barack Obama’s karmic contract was to be a catalyst for hope. Hope only works in the individuals who choose to carry it or act on it. The effects of his catalytic process were most outwardly apparent in the ways that people were activated to vote or to make changes in their communities. But the greatest actual effects occurred within people’s minds and hearts. The massive shift toward hope and empowerment cannot be measured but rest assured, the world is a more peaceful place and more people have moved forward in enlightenment based on the role he has played. Now, the work and the way forward are yours to determine. Remember that all of you have been oppressed in one way or another. It is not your fault that you have been oppressed, but it is your responsibility to actively choose to reassign your personal authority to yourself, to re-determine and revitalize yourselves to make positive changes in the world around you. This reclaiming of your personal power, and it’s collective potential, ultimately is the process that Barack Obama was meant to catalyze. His calling is to inspire all the citizens in the world into action. He will not make the world a better place through his actions; instead, he inspires all of you to make the world a better place. YES! Every now and then every space can use a good reaming! And speaking of holes, tearing new ones… in the fabric of space/time… has been a rather daunting and dirty task recently, BUT (and I know I’m breaking… protocol… here [wink] because we ALL know what “buts” are for [smile]) someone’s got to do it! And so it is that we see fit that our task today is to reveal to you a new(old) way of “cleansing” and “purification” so as to establish a better groundwork for what is to come. Some of you have been going through your own process of renaissance and renewal, and to you we say BRAVO! Well done!! Your New Day is on the Horizon and soon a whole New Earth will be Dawning in the light of that New Day!! The worst is really past you now! However, we feel that perhaps a “clean sweep” will make it easier and pave the way for a more comfortable arrival and landing in your “new home”… that renewed space within you where Love resides – the new Crystalline Matrix of your Light Hearts (we would typically use the terms Light Body here, but since it is seen that your New Being – that which is primarily Love – resides within your Hearts we felt it appropriate to refer to this New Home as “Light Heart”). So, on with the clean sweep! There has been a bit of frustration and confusion going on down in “channel land” as of late. Many of you have taken to heart what was revealed some time back that All will have the opportunity to discover their individual abilities to receive messages from Higher Dimensions as we get nearer and in fact cross over – pass through – these very important energetic portals that we are now experiencing. Of course! It only stands to reason that as your own vibrations rise the better attuned you become to the New Dimensions you will be entering! That being said we would like to commend those of you who have been doing such a fine job of receiving information from your extended Family! Again, well done! And most of you have done an excellent job discerning which of the messages you receive are intended to be just for you, or whether they are messages of a broader application intended for publication to the general masses. We appreciate the way that so many of you are consistently “in your hearts” when you receive and publish messages that are intended for the masses to read! Your messages are Heart centered and filled with Love and Light which is exactly the purpose of conveying these messages in the first place – to establish as part of the New Paradigm a higher vibration of Light frequency so as to help facilitate the process of Ascension for those of you who have opted to participate in this Mass Ascension at this time. And as we continue toward this event there will be those who because they are just awakening still require guidance from those of you who are walking a ways ahead, and it is to you that we say, carry on! This is one of the things that you came here for! It is however clearly obvious to many of you that some messages have been slipping through which perhaps are not as Heart centered as they could be. We are not going to make any assumptions or suggestions here, but perhaps you might have some plausible ideas of your own as to why this occurs. Needless to say it has led to some rather interesting confusion within the Lightworker community and on out into the multitudes of newly awakening Souls. The interesting thing about this is that it has caused a sort of an “imbalance” (or perhaps the term “mess” would be more appropriate here) within the Universe energetically speaking, for which it may also be clearly obvious to you will require a bit of “clean-up work” in order to even things out again. The Universe, however, is a pretty amazing Housekeeper in that such imbalances don’t last very long and just like a balance scale that gets tipped in one direction too far, it ALWAYS comes back to the center point at some point, even if at first there is a bit of toggling back and forth from one end of the balance to the other. In this case think of it like this: The Universe is a huge basin in which information has been placed. Pertinent information (we’ll refer to Heart centered information as being pertinent in this case) is retrieved and replaced at a constant, consistent rate so as to not upset the balance too much at any one point. A problem might arise, however, when impertinent information (and we’ll use the example of “non-Heart centered information here to represent the impertinent information) gets dumped into the basin rather unceremoniously, and the resultant displacement of information in general creates a rather pronounced “sloshing” effect. I’m certain you can see where we are going with this; that it’s not WE in the higher dimensions who will be performing the “Housecleaning” but rather the Universe Herself who will be providing this necessary task, and quite naturally too, I might add. [smile] Yes, that’s right, information has sloshed from one side of the basin to the other by the imbalance that has been created, and now it is in the process of sloshing back again. Only now, because of “where” we are currently “at” from and energetic standpoint and the Higher Vibrations creating a much more pronounced effect on just about EVERYTHING in recent “times” the sloshing effect that has been created will complete a clean sweep of ALL impertinent information that is currently being, or has been recently dumped into the “information basin”. What does this mean exactly? Well, what this means is that while information whether pertinent or not will still flow freely, just as is true with ALL Energy that is approaching the threshold to the Higher Dimensions, if it does not resonate sympathetically with the frequencies found Higher Dimensions, it will simply not pass through. It gets “sloshed” clean out of the basin and VOILA!! No more static, no more confusion, no more mess! Clean sweep!! You will note, as you probably already have, that less and less information of the impertinent type is making it through these days, so in terms of the clean sweep that has been mentioned here, it is already under way, largely undetected by those who have been delivering this type of information. This is another amazing trait of the Universe; to be able to complete these cleansing feats in such a way as to cause the least amount of shock to the population at large, especially to those who seem to be rather oblivious as to the type of information they have been delivering. YES! You have been feeling much of the cleansing Energies coming at you especially in recent weeks and days as they are ramping up at ever increasing rates. However, these are typically only felt to the extreme by individuals who are particularly sensitive to them, namely the ones who have been the trailblazers and the wayshowers, the ones who have been in the forefront for all this time. They are the ones who, while they may not have always been recognized as such, and some have only come into view of the community at large recently, have been here the longest, making way for those who would follow, basically “taking one for the team”. We truly appreciate all their hard work and diligence. We would like to point out that whether or not you are feeling these Energies is not in itself indicative of “where you are at” in terms of your progress toward your own personal Ascension. Each individual is unique and therefore has a unique experience with that regard. Those who are still in the process of Heart centering, however, may perhaps not feel it quite so extensively and may continue on for some time with their purveyance of “impertinent” information, quite unaware of what is going on around them, until one day they realize that people are no longer paying them any attention. In conclusion, we wish to say that if you have been concerned about all that has been going on lately with regard to confusion over certain information you have come across, concern yourselves no further. ALL is in Divine Order, going according to Divine Plan in Divine Right Timing. There is no need for anyone to take up reins to make certain that certain messes get “cleaned up” because as you can now understand, the Universe has had things in hand the entire time. You are being Divinely provided for, Divinely protected and Divinely Loved by ALL That Is. I AM Archangel Michael incarnate as Ashtar Sheran. St. Germaine: I am St. Germaine. SB: Hello, St. Germaine. Welcome to our program. St. G: Welcome to you, welcome to each of you, my dear brothers, sisters, friends, allies. I am honored to follow our beloved Archangel Michael, and I am humbled to do so. Yes, I know very often I am thought of as arrogant and full of bravery, but actually I am very humble. So, where do you wish to begin? St. G: Yes, that too! SB: Delightful mischief! Let me tell you what I’m hoping we can cover in this half hour. I’m hoping you can give us a bit of the history of NESARA, going back to the time when you started the World Trust with Paul the Venetian and Serapis Bey, and then maybe tell us a bit about how you guided the growth and maturation of the Prosperity Program since that time. And then I’ll have some questions for you on how NESARA will be implemented, and where the gold associated with NESARA has come from, what its spiritual qualities are, and its importance to Gaia. So that’s where I’d like us to go, if you’d be so kind. And then I anticipate that you’ll have many joyful detours along the way, shall we say. St. G: You know me. I always have detours. SB: Absolutely, and that’s just fine with me. St. G: But yes, I would be pleased to begin. Because what we do this day — and it is an important time, truly, in the unfoldment of the human experience — so I take you back even further to the time of the beginning, when we have witnessed the beginning of the growth, the anchoring of duality, and yes, polarity, in the human psyche and behaviors, and the growth of darkness and of the illusion of separation. For all of this has a very long and dark history, does it not? St. G: And then of course you saw this in Atlantis, when the riches, yes, of Lemuria and Atlantis, were so remarkable. And I do not simply mean gold. I do not simply mean currency. But the richness of the society, of the culture, of the interaction with your star brothers and sisters, the cross-fertilization, the beauty — it was all there. And then again this desire for control, for arrogance, for power, once again destroyed what was clean and beautiful, what was healing. When I lived upon Earth, upon Gaia, this beautiful planet, in my rather lengthy incarnation as St. Germaine, what I witnessed was the strength of the solution of haves and have-nots, to put it in your very concrete, current terms. And I do not simply mean money. But money, currency, so often was the driving engine behind control, behind power, behind what I would call very negative mischief. And those who did not have money — and this is true to this day; not so much recently, in the last couple of years, as light-workers are breaking through, but it is still true to a great extent — the belief that if you do not have, even when you have worked through many, many issues and you know that you are loved and lovable, there is still this quality of fear, of separation, of feeling less-than, if you do not have the money, the currency to support yourself, to support what we would call very basic human needs. So what I had felt, what we had felt, particularly my dear friend Serapis Bey, but also El Morya and Paul, what we had felt was that if there was an equalization, if this illusion, this dichotomy of have and have-not was eliminated, then the human spirit, the psyche, the ego, in balance would be free to flourish and for the human being and the collective to truly become what has always been the plan and envisioned for this planet, now. So we began putting away, not only etherically but actually, money, gold. Treasure was set aside, for you know also as an alchemist, it is very easy to create in this way. Now, we do not often speak of the alchemy and the work that I have done in that realm, and the ability to create the simple energies or codes, but let us just suggest that monies have been set aside. This is not a fairy tale. This is not a dream. This has been an undertaking, by myself with friends, of a concrete plan of how we might address and break through this most fundamental issue of lack of self-worth and self-love. Because also what I noted, and have noted for many, many thousands of years, is that when people have what they need, then they truly do believe that what they conceive of as God is on their side. And when that concern with the daily maintenance is addressed, then they give themselves the freedom to expand and explore. Now, that freedom has always been there. And it is certainly the freedom upon which I have based the United States of America. Now, there have been many attempts to dissolve this Trust, to steal it, to take it away. [laugh] There have been many attempts. But we have many protections throughout the universes, and there are certain things that simply aren’t allowed, regardless of will and free choice. And this type of theft is one of them, because it is a divinely consecrated Trust. As you know, there have been wars, and there has been a great deal of political intrigue. Let me give you something to think about. So often, when you have thought of the explorations of the New World, you have thought of the plunder of the indigenous tribes, indigenous peoples, and the plundering of their resources, their wealth, their gold, their jewels, and the bringing back of that treasure to Europe — for it is not just Portugal or Spain or France or England; it’s been many nations, and this is a long history. But I give you this idea: that there was also the transfer of a great deal of treasure to the New World, because I knew it would be safe there. I knew it would be buried. I knew it would be entrusted to certain Earth-keepers, and myself. And there were also troves placed in the caves of Tibet and specific other places that I will not mention as yet. But that is one of the reasons, not just political or religious, why there has always been so much interest, particularly of recent, of the Chinese in Tibet. There is a knowing of what is available there. But I digress. SB: St. Germaine, there’s even talk of gold being brought from other planets. And of course there’s the gold that’s sunk in battleships. SB: So there’s a lot of gold on this planet. Is that correct? St. G: There is more gold than you can imagine. And there is certainly more gold — think of it as currency — there is certainly more gold than has been assumed. There are caches of gold that have been placed there all over the grid. And sometimes the gold has been hidden in very plain sight. Now, why have I not talked about this a great deal? Well, I certainly spoke about it when we founded the United States of America and when we insisted that all people be free. But that has not fully come to pass. It is only now truly being anchored. And that spreads, yes, like the mushroom cloud, it spreads freedom and love everywhere. But I don’t want to digress. But I also wish to say much of my work upon the planet has also been about healing. And the reason is that the healing of this very core issue had need to take place, or at least to a point where the final push, which is underway right now, could take place. So this illusion of poverty, of have and have-not, can simply be eradicated. And you are correct, and there are also minerals that have been placed upon your planet by your star brothers and sisters that are far more valuable than gold. They just have not been discovered or detected yet. And that is to come. But that is not part of the Trust that I am speaking of. It is ancillary. SB: All right. And palladium and vanadium I think are two of those metals, are they not? St. G: Yes, as well as serenium. SB: Serenium? The last two are metals we haven’t discovered yet, I think. St. G: The last three are metals you haven’t discovered. SB: Okay. One question I’d like to ask you before we have to leave the air, because I know it’s on a lot of listeners’ minds, is when NESARA comes in, it’s been said that you’ll simply add zeroes to everyone’s bank accounts. But will not the landlords and the car salesmen and the bakers simply add zeroes to their rents or prices? SB: Why do you say that? St. G: And that is why the opening and the flooding of the love portal had need to truly take place. What you have need to realize is that the bankers, the car salesmen, the baker, the butcher are as soul-tired as you are. They may not know it. There may be a slight fluctuation, but also know that those zeroes are going to be backed up because it has need to be backed up in order to avoid what you think of as chaos, of the political theft and maneuvering that has taken place for centuries. And frankly, I am tired of it. So it will be backed up by what you think of as gold and metals, currencies. St. G: But it will not be just an inflation so that you are as poor as ever. The entire plan — it doesn’t matter what you call it – NESARA has become very politicized, has it not? St. G: Of course, then those in power, who wish to maintain the control scenario become very paranoid about NESARA. So if you think about it as my equalization plan or my birthday gifts to all of you, as you are reborn, let it be that you are given the wherewithal to follow this passion in this straight line, this drive that you are feeling of what you must and what you choose and what you wish to do and to co-create with us. But I will not repeat or help to repeat any errors that have occurred during the time of Atlantis. It cannot come from a place of greed. It cannot come from a place of neediness or desperation. It simply comes from the recognition that of course you deserve this; of course you are worthy. The person that is living in the ghetto of Chicago and struggling to feed her child and to keep that child safe, with gunshots all around her, needs to know, from our perspective, that she is as worthy as any being on the planet. And that when that support, whether it is a bowl of gold on her table, a bowl of money, a check under the door — because we know not everyone has bank accounts — or a bowl of fresh fruit, when this begins it will be literally like manna from heaven, and it will be appreciated because it is coming from a place of love. When a child gives you a flower that they have picked either from a field or your garden, it is a gift of pure love. That is the way it will be received. So you do not slap the child’s hand. You do not say, “But I own that garden.” It touches you in such a deep place within you that you cannot help but smile and say thank you. And there is no desire of the person watching that interaction to rip the flower out of your hand. And that is what has happened in the past. The flower has been ripped from your hands time and time again. And then you turn and you say, “Oh. So it is true God does not love me. He does not care. He does not think of me.” And that is the illusion. And that is what Paul and Serapis and I have endeavored to change. And we will change it. And the time is now. SB: Well, Lord, picking up on your mention the time is now, we probably don’t want to hear dates [because no dates have come true as yet], but at the same time our listeners I’m sure are all asking themselves, when might NESARA appear? Without giving us a date, can you give us a hint on when we can expect NESARA? St. G: Look out your window and say, “I allow, I am worthy, and I receive.” Look out and call me and simply say, “I’m ready. Let the delivery come.” It can be that fast. St. G: And if you are not home, we will leave a note on the door. SB: [laugh] Your package is waiting at Federal Express. St. G: Yes, it is definitely express! SB: All right, St. Germaine. Now, the last question I have is gold is said to have special spiritual properties, said to be important to Gaia. Can you discuss those properties in the few remaining minutes that we have and what must be done with the gold for the sake of Gaia, please? St. G: The gold has need first and foremost to be used to cleanse Gaia. The reason that gold has such special properties, particularly to Gaia, particularly to this planet — and I do not mean to denigrate the other minerals or metals that will be found — but it is purity, it is grace, it is joy and it is wholeness. SB: Thank you, St. Germain. St. G: I love you all. And I gift you all. Farewell. Below is an email from Linda Masterson, a MoveOn member in Felton, California, who created a petition on SignOn.org, the nonprofit site that allows anyone to start their own online petition. If you have concerns or feedback about this petition, click here. According to investigative journalist Jon Rappoport, more than one million votes on Prop 37 (the GMO labeling initiative) in California have gone uncounted to date. Since the margin of "victory" is about 600,000 votes, this means Prop 37 may conceivably have passed. Rappoport called the voter registrar offices in the largest California counties and nearly 1.7 million votes remain uncounted in Santa Clara, Los Angeles, San Diego, and Orange Counties alone. It is still unknown how many votes are uncounted in other California counties. Click here to sign the petition: Count every vote on Prop 37. We petition Debra Bowen, secretary of state of California, to require that ALL votes cast in the November 6 election be counted immediately. We specifically demand that ALL ballots in the following counties be counted and recorded: Los Angeles, Orange, San Diego, and Santa Clara. We demand that the results of this complete ballot counting be made public immediately. This petition was created on SignOn.org, the progressive, nonprofit petition site. SignOn.org is sponsored by MoveOn Civic Action, which is not responsible for the contents of this or other petitions posted on the site. Linda Masterson didn't pay us to send this email—we never rent or sell the MoveOn.org list. Here is what Tolec (www.andromedacouncil.com) has written about this. “The electromagnetic particles that will be flowing & interchanging between the planets during the 12.21.12 alignment will be highly magnified and highly supercharged when they reach Earth. They will penetrate the crust, through the Earth and down into its core. There ARE happy people around the world. Not everyone is fighting. The love and peace being established on Earth is growing exponentially, and as each day now passes it is encompassing the whole world. To a greater or lesser degree every soul is being affected by it, and some find it more easy to take into their being than others. So each soul is given the same opportunity for growth into the Light, and to take part in Ascension. However, knowledge of the Ascension process is not necessary to be assured of rising up with it. There are many, many souls that are kind, loving and compassionate who are also ready for such an upliftment. In fact they may have quite a different view of the future, but that does not matter as they will soon adapt to the coming changes. As you know, every encouragement has been given to Humanity for a considerable time, to turn to the Light as we desire that as many souls as possible are lifted up. Some souls turn down point blank any approach made to acquaint them with Ascension. In those circumstances they are provided for so that they can continue on their chosen path, that will give them further opportunities to ascend. There is no pressure put upon such souls, as life is infinite and you have as much time as you like to evolve. Although your coming Ascension is a high point in your growth you will continue to follow a path of soul evolution, but it will never be as tough or demanding as the period you have just gone through. if you are well along the path of Light you will have determined what "baggage" you are carrying, that is best released to fully prepare you for Ascension. You are often tied to habitual practices that you attribute to the needs of your physical body. It could be addictive substances such as nicotine or drugs in general. Be assured that once you put your mind to giving them up, you will find it easier than you might have expected. Such pleasures of the body have no place in the higher dimensions, and the higher your own vibrations the less dependent you will be on them. So know that the answer is in your own hands, although you will get assistance from our side of the veil. You are never alone in your endeavors to lift yourselves up, so call upon your helpers to work with you. On Earth you have learnt to fight for possessions and talk of ownership as a right. That has largely been due to the dark Ones who have systematically kept you in constant need, even for the basic items that are needed to exist. In the future you will experience abundance and never again want for anything. God provided and it is Man who divided so that there were two classes of people, the rich and the poor. The so-called shortages have been the result of control and manipulation to enslave you to the big corporations. It has also meant that you have been denied advances, that would have immediately given you a better quality of life such as for example free energy. It will be given to you very soon, and at a stroke change the quality of your lives. I am SaLuSa from Sirius, and pleased to continue my messages, intended to prepare you for the New Age. Looking back it is quite extraordinary that we have been in contact with you for some 70 years, and look where you all are today. You are familiar with our presence, and in general accept that we are your family. We feel that we have achieved so much in a relatively short time, and here we are so near to being able to openly visit you. We look forward to those times when we can share many things with you. Walmart workers are mad. For years, they have faced poverty wages, dangerous working conditions, and unreliable schedules. Full-time Walmart associates can make as little as $15,500 a year -- so hundreds of thousands of these workers are living in poverty, while the Walton family heirs have more wealth than the bottom third of American combined. And Walmart workers are standing up for their rights. For the past year, they’ve been organizing and demanding better treatment. But management has offered little beyond but threats and retaliation. So now, Walmart workers are getting ready to go strike on Black Friday, the biggest shopping day of the year. This strike could be the straw that finally breaks Walmart’s worker-mistreating back -- but only if people know about it. Unfortunately, as usual the mainstream media hasn’t paid it much attention. Can you show your support for the strike by sharing this image on Facebook or forwarding this email to your friends? Carlton Smith, pictured here, is just one example of a worker risking it all to go on strike on Black Friday. He isn’t anyone’s idea of a troublemaker or a rabble rouser. The grandfather of four has worked at a Paramount, California Walmart for 16 years, starting as an overnight stocker. Over the years, Carlton grew frustrated with the way Walmart treated his coworkers, who became like a second family to him. As profits and executive pay climbed higher and higher, Carlton’s friends’ wages shrank and their hours were cut until they could barely make ends meet. Carlton wanted to stand up for his coworkers, so he joined the Organization United for Respect at Walmart (OUR Walmart, for short), a group of workers that advocates for better treatment. Carlton talked to his fellow employees and did outreach to the community; he flew to Bentonville to talk to CEO Mike Duke and Walton heir Rob Walton about the need for change at Walmart; he even introduced a shareholder resolution protesting overpayment of executives. But conditions at Walmart remain appalling -- so Carlton isn’t giving up. Not even close. Last month he joined hundreds of other workers at Walmart’s corporate headquarters to demand an end to retaliation against workers who speak out. 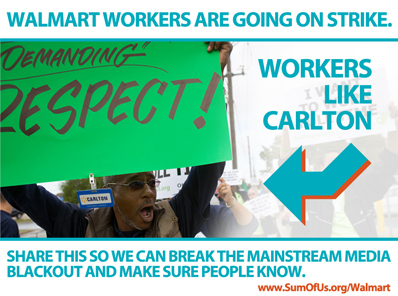 And if things don’t change over the next week, Carlton’s joining the strike on Black Friday. to facilitate these sessions for others in your own practice. 25 Bankster Takedown has Begun! Word out today that the LONG AWAITED take down of the banking cabal has begun. First sign...Jon Corzine is to be BLAMED for the MF Global collapse! If you attended my Silver Summit speech you'll also know that 9 of the 11 LBMA Silver Market Making Members are under investigation for collusion and price fixing. Memories of unpleasant experiences will eventually fade completely into the background of your consciousness, and in time be forgotten. Often the only thing that keeps them in your minds, is the pain and distress experienced but once in the higher vibrations you will cease to bring them back. The energies of Love are the most powerful in existence, and as you will find can create "miracles" particularly in healing which many of you have a great interest in. After Ascension your abilities to create and heal will be enhanced, and at the same time you will be assisted by the hardening out of the City of Light, Sedona. It will become a Mecca where thousands come for healing of the mind, spirit and soul. In reality there are millions of people that need some form of healing and help in other ways, and it is why the other 12 Cities of Light will soon follow on. Do not worry that your needs will be overlooked, as we know all of you quite well and no one will miss out. I am sure you are intrigued by our skin tight space outfits, that we "dress" ourselves in through the power of thought. If they get soiled or damaged the fabric as you may call it, can put it right through its own level of consciousness. Much is designed that way so it needs no attention from us. Indeed, our organic computers are so programmed that they are completely self functioning, and have greater levels of consciousness than we do. This is where you get to after 1000's years living in the higher dimensions. So believe us when we say that we can handle anything connected with your Ascension. All will proceed as planned, and continue well after Ascension as you benefit from the new energies. We have the priorities sorted out and will have them attended to in no time at all. designed to launch humanity into the 5th dimension. are here to live, love and create as your Presence. living as your Presence in Unity Consciousness. your many sojourns on the Earth and elsewhere. you in co-creative Golden Age projects. lived in oneness in previous Golden Ages. Masters who are already living in their freedom. book or safe list for uninterrupted delivery. Thanks! Once you go down the rabbit hole, you will discover things that most people don't know. Here are 40 outrageous facts that most people are clueless about. ...and as history repeats itself, Prescott Bush, father of George HW Bush and grandfather of George W. Bush, funded both sides of World War II. The Bush family have been traitors to the American citizens for decades. 38. The depression and World War II were a total farce. The United States and various other companies were making loans to others all over the World during the Depression. The building of Germanys infrastructure in the 1930's including the Railroads was financed by the United States. That way those who call themselves "Kings," "Prime Ministers," and "Furor. "etc could sit back and play a game of chess using real people. Think of all of the Americans, Germans etc. who gave their lives thinking they were defending their Countries which didn't even exist. The millions of innocent people who died for nothing. Isn't it obvious why Switzerland is never involved in these fiascoes? That is where the "Bank of International Settlements"is located.Wars are manufactured to keep your eye off the ball. You have to have an enemy to keep the illusion of "Government" in place. 39. The "United States" did not declare Independence from Great Britian or King George. 40. The etymology of government means to control the mind. From Latinised Greek gubernatio "management, government", from Ancient Greek κυβερνισμ�ς, κυβ�ρνησις (kybernismos, kybernesis) "steering, pilotage, guiding", from κυβερν�ω (kybernao) "to steer, to drive, to guide, to act as a pilot" plus Latin mente "mind".